Delft City Hall is besides one of the most important structures in Delft also a quite impressive one. Primarily it is the seat of power in the city. All of the local political events are held in this building. Originally the old town hall was burnt in 1618. Most of the structure was damaged except from the tower and a few walls. But it was reconstructed in 1620. But during the 19 hundreds the city hall was reconstructed to give way to the modernization of the city hall. Today it is still used as a public office and weddings. 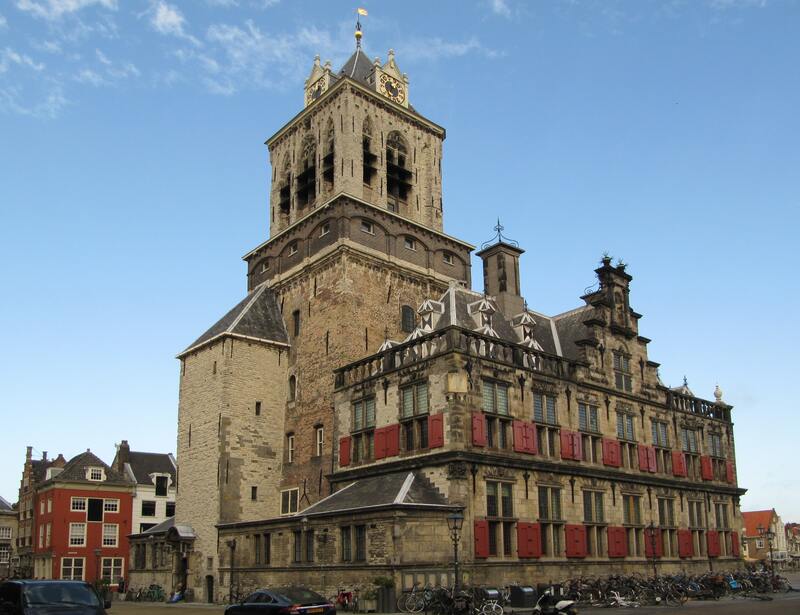 The Delft city hall is a great example of a renaissance architecture. The façade of the city hall shows a typical renaissance structure. With its highly structured columns and arches, it gives way to its warm welcome and a renaissance feeling. The balcony of the façade gives delight to anyone who visits. The columns of the city hall mark the spirit of the renaissance era and the revival of the architectural design of the ancient Romans and Greeks. It gives visitors the chance to discover medieval artistry. The arches and the vaults of the city hall give way to the elegance of the structures. Also the dome which is the center attraction of the city hall was the epitome of power and grandeur of the city hall. The ceiling of the city hall is filled with intimate details and shows how this building was carefully built. The magnificence of the structure was the clear indications of how rich Delft was during medieval times. The entrance doors filled with intricate details welcomes its visitors with the feeling of elegance and sophistication. The windows are often paired with intricate details which give way to its simple yet elegant style which makes the city hall more favorable to visit. The City hall is open every day during office hours except on Saturdays and Sunday.